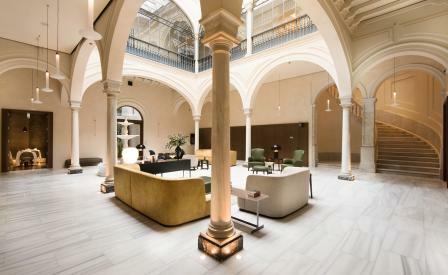 Following a successful debut in Barcelona, Spain’s Mercer hotel group (no relation to its Manhattan namesake) has opened its sophomore property in Seville. The bijou 12-room boutique property at the end of a quiet street is the work of Cruz y Ortiz Arquitectos and interior designer Amanda Molina, who transformed the grand spaces of Casa Palacio Castelar, the former home of a prominent 19th-century nobleman into an unexpectedly intimate bolt-hole. There are visual splendours at every turn. The high-ceilinged lobby, restaurant serving Andalusian staples with a twist, and bar are embedded around the central Andalusian courtyard. The eye roams admiringly over ornately wrought grilled gates, beautifully restored plasterwork and mouldings, spiralling marble staircases, a modern chandelier designed by the architects, and a glorious glass-topped canopy. A stainless steel plunge pool on the roof-top is a sybaritic pleasure as is the hotel’s proximity to Seville’s landmarks – the Torre del Oro, La Giralda and Real Alcazar.